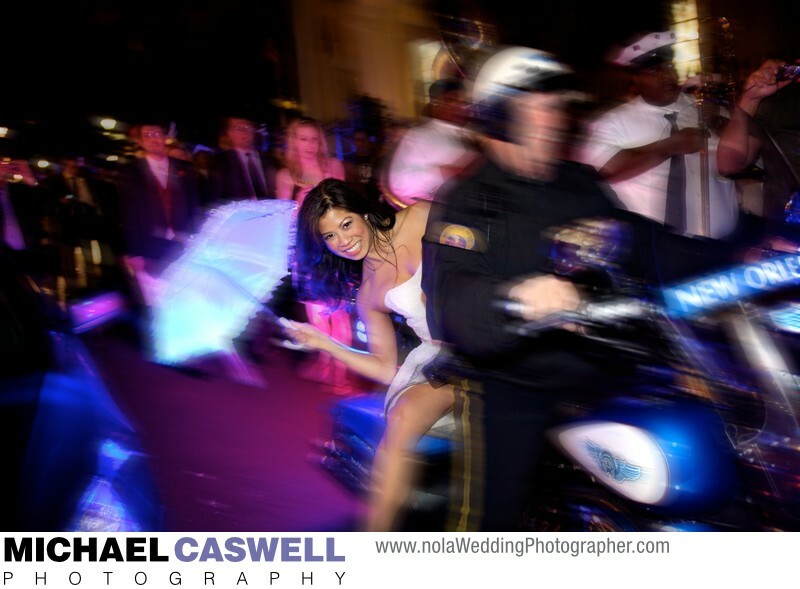 It's not very often that you see a bride riding on the back of a police motorcycle through the streets of the French Quarter! But this is New Orleans, and stranger things have been known to happen. About halfway through an unusually long route for a wedding second line parade at the end of the night, this petite bride became tired and didn't think she'd be able to make it all the way back to the Maison Dupuy Hotel where the ceremony and reception had taken place. So, she asked one of the escorting police officers if she could catch a ride for a while to rest her weary feet. I'm generally not a fan of noticeable Photoshop effects, but in this case I made an exception and selectively applied some motion blur to obscure the officer's identity, as I didn't want him to get in trouble with his superiors for his act of kindness.